In this session, the Honourable Union Minister of Finance got the convention underway. He outlined some of the key challenges facing the country especially the industry and how an august gathering at CII can help solve of the major issues. 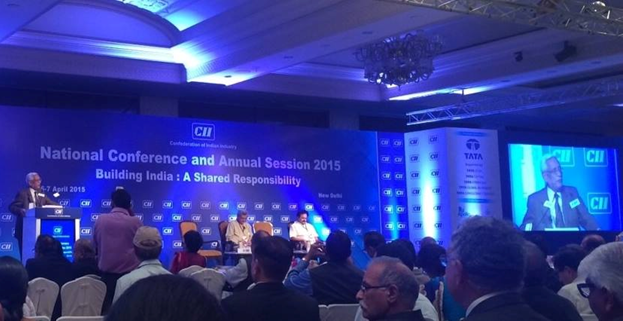 He also acknowledged the work CII has done in various spheres including the social sector. This speaker spoke at length about the concept of a smart city. He firstly explained that a smart city does not mean that the people are ‘smarter’. Instead it is a city which is very well connected via digital and electronic media. Especially crucial here is the link that residents of the city have with the government authorities. He outlined how Cisco has enabled systems across the world aiding in the process. The city of Barcelona in Spain is one such fine example where kiosks have been set up inside shopping malls where city residents can register their complaints or file their payments to authorities without having to go the route of government officials in government buildings. Cisco has helped automate all such processes leading to a far greater ease in governance. The ILFS chairman started out by lamenting how people compare places and often he hears the remark that a certain activity will not be possible in India. He did acknowledge that certain procedures may not be exactly replicable but felt that tailoring a product can lead to advantages. Like the previous speaker, he too took the example of Barcelona and added Dubai for good measure citing these 2 cities as the perfect role model for an aspiring smart city as New Delhi is. He mentioned for good measure that per capita income in Barcelona (Spain) or Dubai (UAE) is much higher than anywhere in India and that poses complications. But a start needs to be made. The Union Minister though from the Bharatiya Janata Party (BJP) began his talk by homage to some of the great leaders of the country in the recent decades. In particular he spoke about Mr. Narasimha Rao, Dr. Man Mohan Singh (as finance minister) and Mr. A.B. Vajpayee as being statesmen with a vision. Then he began speaking about the present government of which he was a part of and in particular spoke about the leader- Mr. Narendra Modi- and how the government has steered clear of all scams of any kind in their first one year in charge. He criticized certain sections of the media and opposition who have ventured to say that the Modi government may not have kept up all of its promises, but the speaker reiterated that in a democracy everything had to be done via a system. Breaching the system was not possible, nor were instant results as all stakeholders had to be consulted before any major decision making at policy level. This session was followed by the Networking Lunch Break. The speaker spoke about how the policy makers of this country need to have a clearer vision of what needs to be done. Catching up China was becoming an area of concern as in spite of a later start China has fast forwarded to being an industrial and economic giant leaving India well behind. During this talk another important thing that happened was Mr. Azim Prewmji, Group Chairman of Wipro Industries was felicitated with President’s Award from CII. This annual award was bestowed upon Mr. Premji to recognize his outstanding contributions to the world of business, technology and philanthropy. He and his business group stand at the forefront of India’s recent growth story. The speaker explained his position at the AB Group and how he and his team needs to study all national policies to formulate group strategies. Basing on the statistics available and the budgets sanctioned, group strategies get formulated accordingly. For this event, 3 political stalwarts from 3 of the biggest political parties were invited to the discussion panel. However, one of them – Mr. N.K Singh of BJP- could not come due to some technical reasons. Mr. Sitaram Yechury from the Communist Party of India (Marxist) was the main speaker during this session. There was a mention of the usual strikes & lockouts associated with the communist movement in India during the welcome of the speaker. The CPI(M) veteran then contested the claim by saying that when there is such a strike or lockout no one feels sadder than the labourer himself as the factory is symbolic of his and his family’s earnings. It is only an extreme stage of exploitation that needs to be reached for a labourer to protest in this manner. The speaker also mentioned that he fears he must be the most unpopular person in the convention but stressed that he and his party were not anti-development. He lamented the fact that there was too much discrepancy in society with income gaps between the top 10% and the bottom 40% ever rising. Such an economy he feels is unsustainable and something needs to put a camp on the differences. He also stated that the brain drain from India to western countries especially to USA in the software industry was a massive loss to the country. Thus some enclaves can be set up in the country catering to a mini-developed country so that the engineers from IIT for example find the right conductions for growth and do not need to go abroad. This session was followed up by a round of High Tea. This speaker’s role in this session was more on the welcoming side. His job was to set the tone for the discussions ahead. He did that by addressing some of the key challenges that India faces in infrastructure. He also mentioned regarding the plea among some quarters to do away with all state level road taxes and to implement only one for the whole country. This speaker spoke with particular reference to the telecom infrastructure. He stated that the earlier scams regarding 2G & 3G auctions were a thing of the past. They failed as it was an alien concept directly imported in India without due diligence to local conditions. For internal cargo transport, his government is focusing less on roads, more on railways and most on internal waterways. Mr. Gadkari feels that rivers in India have not been tapped for their transportation uses as much as is done across Europe. Most rivers in India are navigable and costs are a fraction of roadways. On certain routes complete reliance on internal waterways may not be possible. In such cases a syndicated approach will work. A project has been launched under Mr. Gadkari’s leadership whereby a water transport network is to be developed from Kandla port to Chennai using multiple networks of rivers. Thus cargo can be transported over land from the north up to Kandla from where further they may travel by water transport. The system of 1 road tax for the whole nation has been initiated. This will reduce costs and waiting time for the transporters. There has been much controversy and much criticism has been leveled at various governments regarding procedures for land acquisition to build public utilities. Mr. Gadkari reiterated that railways and roadways need to be improved by far greater margin than what they are at the moment and this can only help the poorest of the farmers to get better connectivity. He stated that if rails and roadways need to get constructed then land had to be acquired as there was no alternative to building them. His government has started a system where the farmers’ family gets 35% greater compensation for the land that market price in case public infrastructure utilities need to be built. Some quarters have complained regarding this hike, but the minister states that this will help the poor people and will benefit the nation. He also stated that there were reservations initially regarding land takeover but due to the transparent system, his team has actually received requests for land to ‘get acquired’. The speaker spoke extensively regarding clean and renewable sources of energy which can be used to power transport. He mentioned some pilot projects have been started in some small towns in his home state of Maharashtra where waste water instead of being dumped in to the waterways, is instead getting re-used and converted to fuel. He feels that in India the usage of biogas is quite low as opposed to other countries, thus specific limits are being sought by the government to promote the usage of sugarcane (of which India is a massive producer) bagasse as a percentage of fuel consumption. As the moderator of the session, this speaker introduced all the panel members and set the tone for the discussion. He spoke about how digital was the way the world was moving as opposed to the time when his ancestors had started off their business few generations back. The idea in those days was building a safety net and getting into a family business which would secure everyone concerned. Now the generation was willing to take risks due to the more favourable business environment. This speaker spoke about CII’s role as an industry aggregator and how CII strives to connect people within this industry to cooperate and take ahead these business interests. He acknowledged that India had a long way to go in this industry but India was catching up fast. NASSCOM plays a similar role in the technology sphere as CII plays in the overall business world within India. Thus if India is to hit the heights of the developed countries then NASSCOM will have to be at the centre of such a revolution. The speaker says that the digital world at the moment can be divided into 4 sections on the scale of digital connectivity. SO while India has a massive population and a fairly well developed mobile phone connectivity, the internet and digital media lagged behind. India is at stage 2 right now 2 stages below the ideal top level. Thus the speaker illustrated the tremendous potential for growth in this industry as very little has actually been penetrated. Even with a percentage increase, in a large economy like ours, that will lead to substantial gains for the players and users. This session was followed by a session of Networking High Tea. The speaker introduced the concept of this session which stated that India must manufacture locally. However, this was not a veiled version of protectionism, instead it is an idea to promote cutting edge manufacture within the competitive nature of the country. He paid homage to the fact that Japan is considered as a spiritual capital of smart manufacturing and the country is helping India through various technical and financial measures so that India can attain self-sufficiency with regards to manufacturing. This speaker started discussing at first regarding smart manufacturing and the concept of TQM which his country Japan had pioneered. He showed us through a series of slides, the methods by which VLFM works. VLFM is a Japanese body of manufacturers aided by JICA bank and follows a spiritual path to success using ancient methods followed by the Lord Buddha. This session was followed by the Networking Lunch. Mr. Sumant Sinha Chairman & CEO ReNew Power Venture Pvt. Ltd.
Due to the paucity of time, 3 of the speakers mainly participated in the round table discussion but did not address the audience exclusively for any substantial period of time. The only speaker who spoke at length was the minister who covered most of the major points as stated out in the agenda for the programme. The speaker in this session states out the intentions of his ministry over the next calendar year. In particular he spoke about how a number of new coal blocks have been added from where mining is taking place. This is being done to stem the imports from countries like Australia for coal and to promote local industry. He also mentioned that at present India is known worldwide for the services industry but his ministry has plans that the primary industry including mining and the secondary which employs vast amounts of coal will add substantially to the overall contribution in the economy. The major theme of this talk revolved around the concept of Public- Private Partnerships (PPPs). The speaker however added a fourth P to it calling it – People. He feels that without the co-operation of People, a PPP will never succeed. Ultimately it is people’s land which is being encroached upon. His ministry has also been very careful with regards to fresh construction around forest areas or animal movement corridors. This session served as a sort of valedictory with the 2 days’ proceedings coming to a close. With this CII members thanked all the speakers, organizers and the audience. Also it was acknowledged by all present that ideas & ideals discussed during the 2 days would not remain meager theory but would actually get implemented in the real world.